Baby Shower Cake Recipes | Looking For Scrumptious Classics? Looking For Baby Shower Cake Recipes? If so, let's start with the basics. These classic baby shower cake recipes make a perfect foundation for any baby shower cake. Try one of these white cake, yellow cake or rich chocolate cake, scrumptious classics. Choose from a Classic White Cake Recipe, Basic Yellow Cake Recipe or double the fun with a Chocolate-Chocolate Cake recipe. Also, use these same baby shower cake recipes for your cupcakes to coordinate with your cake. 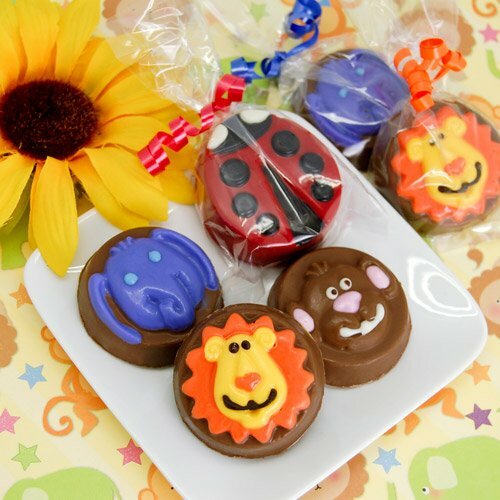 Wrap them up as favors or serve with your cake. Add a favorite filling to surprise and delight your guests! To maintain a purer color, the Classic White Cake recipe uses egg whites but no yolks. This is a must for a traditional all-white, baby shower cake recipes and it also makes it easier to tint than a yellow cake if your using color. Makes: 12 cups of cake batter. Grease bottom of pans and line with waxed paper or parchment paper, or use Cake Release. With mixer at slow speed, add flour mixture to butter mixture, alternately with milk. Beat well after each addition. Beat in vanilla extract. Gently fold egg whites into batter. Pour into prepared pans. Bake until toothpick inserted into center comes out clean. Cool layers in pans on wire racks 10 minutes. Remove from pans; cool completely. Frost as desired. Option 1: Brushing Inside Pan Surface with Solid Vegetable Shortening: The traditional method is to brush the inside pan surface with solid vegetable shortening, then add flour to the pan and tilt and rotate the pan so that all the surfaces are coated with flour. Option 2: Brushing Inside Pan Surface with Cake Release: Brush with Cake Release, which has the flour added to the product already. Option 3: Spray Pan with Pan Spray: The simplest method is to spray the pan with pan spray. We recommend using a product with flour already added or you can coat the pan with flour after spraying. Used In These Baby Shower Cake Recipes? Save A Bundle At Our Wilton Affiliate Store! This simple Yellow Cake Recipe can be used in any cake, cupcake, loaf, or specialty pan. It provides a nice canvas for creating beautiful decorations and can be filled with your favorite type of filling. The yellow cake, baby shower cake recipe is slightly heavier in texture than the white cake recipe. Cream sugar and butter together until light. Add eggs and vanilla to creamed mixture and beat until thoroughly mixed. Spread batter evenly in prepared pans. Bake 30 to 35 minutes or until wooden pick inserted in center comes out clean. Cool layers in pans on wire racks 10 minutes. Remove from pans; cool completely. Fill and frost as desired. Double the chocolate, double the fun! This rich chocolate cake recipe uses squares of chocolate instead of cocoa powder for a cake that’s extra rich and full of flavor. Are your guests chocolate lovers? If so, this is the baby shower cake recipe for you. Spread Cake Release on or spray 10 in. pan with vegetable pan spray. Microwave chocolate and butter in large microwavable bowl at HIGH 2 minutes or until butter is melted or melt on top of range in heavy saucepan over low heat. Stir sugar into melted chocolate mixture until well blended. With electric mixer at low speed, beat in eggs, one at time, until completely mixed. Add vanilla. Stir in 1/2 cup of the flour, the baking soda and the salt. Beat in remaining flour alternately with water until well blended and smooth. Pour into prepared pan. Bake for 40-45 minutes or until cake tests done. Cool in pan 15 minutes on cooling rack. Remove from pans; cool completely. Fill and frost as desired.